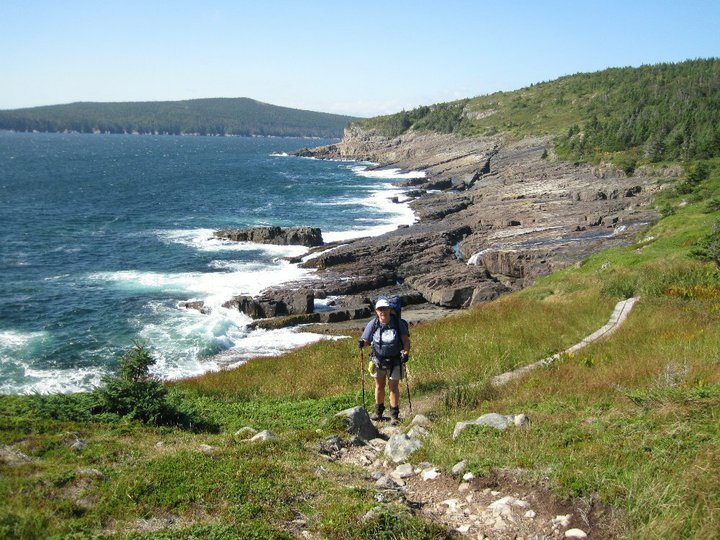 The East Coast Trail in Newfoundland runs along the east coast of the Province along the Avalon Peninsula. 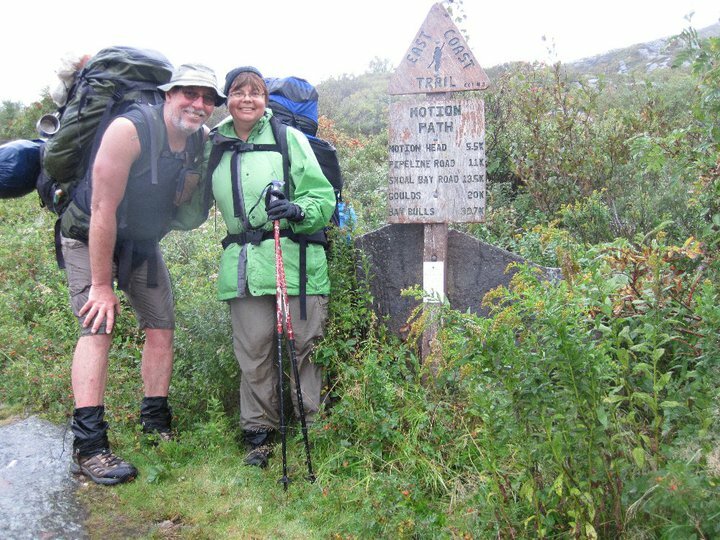 At the time of our trip, September 2010, approximately 150 km of trail had been completed. The route is actually a series of either one or two-day trails that connect communities from Cappahayden in the north to the capital city, St. Johns. 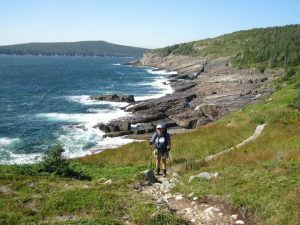 Today, 2017, the web site advertises 300 kms of completed trail. 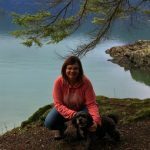 After one unsuccessful, and another successful West Coast Trail hike, I began searching for something similar but different. 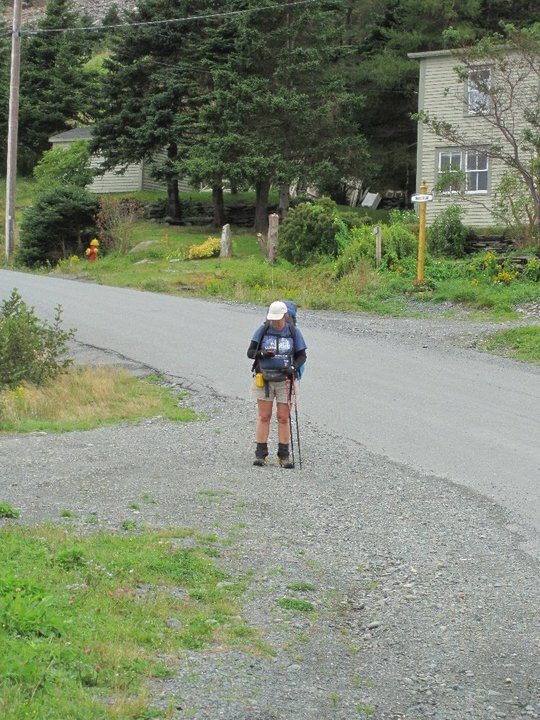 Typing East Coast Trail into google seemed obvious. When I found this trail, it was meant to be. Ray and I spent our honeymoon in Newfoundland – we rented a car and drove around the Avalon Peninsula. It was our first plane ride and our first time seeing an ocean. Back then offshore oil drilling was coming to Newfoundland, and the fishing industry was just starting to feel pain. 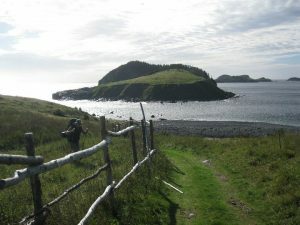 We thought we should see Newfoundland before it changed forever. We are here to hike this trail on our 30th wedding anniversary. We’ll be traveling through the same communities we visited on our honeymoon. Our little joke – 30 years ago we could afford to drive, now we have to walk. 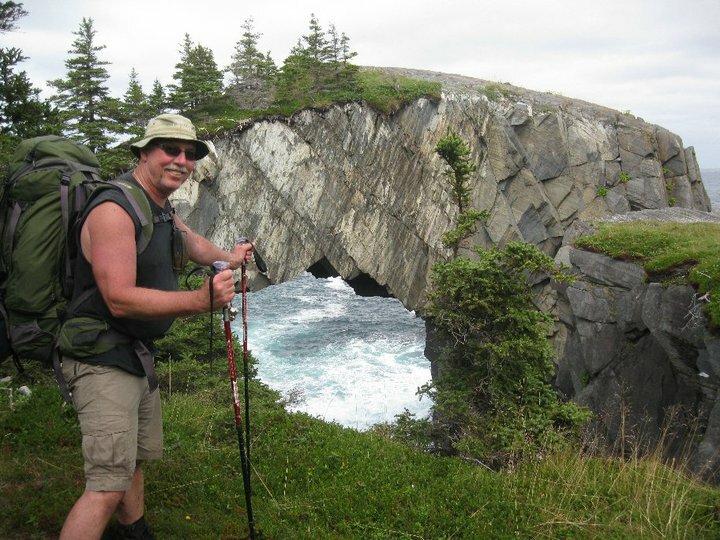 I called the East Coast Trail Association for information about the trail, asking for the guidebook. At least for now, there is no actual guidebook, but they sold me a half-finished publication that waxes poetically about the trail with no real information. We later find that there is an excellent small guidebook, written by a German, in German with no English version. 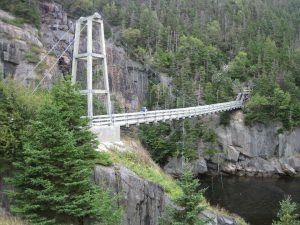 Newfoundland – expect the unexpected. I also inquire about weather – specifically hurricanes since it is September on the east coast and Nova Scotia had just experienced one. As of the time of my phone call, Newfoundland has never experienced a hurricane. There’s another backdrop to this hike. I have just received (and accepted) a formal offer to purchase my company, Granite Internet. At the time of writing we expect the deal to close mid-October. It actually takes a little longer. There is a sigh of relief for me that changes my entire personality. Fifteen years of work will in fact be rewarded. I will not be bankrupting the family. Granite Internet was a house of cards that could literally collapse in any kind of wind, and frequently tried to. For the first time we have decided to walk right from home. How convenient. We have lucked out and found flights that coördinate with the local bus service in Pinawa, and the bus depot in Winnipeg has been conveniently moved to the airport. Departure day is raining so we get to test out our rain gear and pack covers right away. We locked the front door and walked over to the teen centre/bus depot. Flights were fine and we spent the night in a cheap motel in St. Johns. 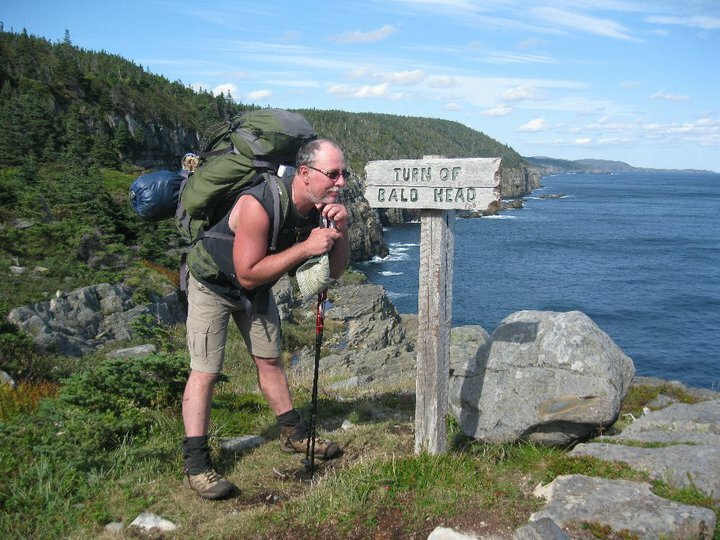 We’ve booked a taxi ride from “Dave” to Cappahayden, Newfoundland, at this time the furthest northern point of the completed ECT. He seems to have forgotten us, but a reminder call gets him moving. 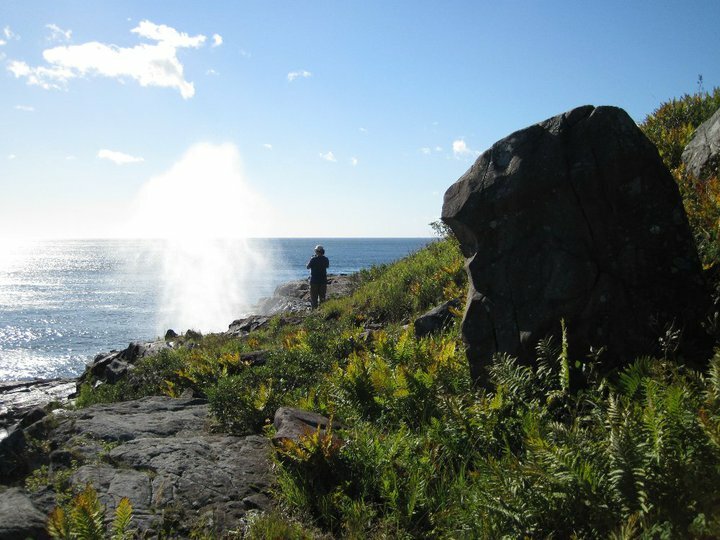 The ECT is set up as a series of day hikes with a couple of longer 2 day hikes in between. 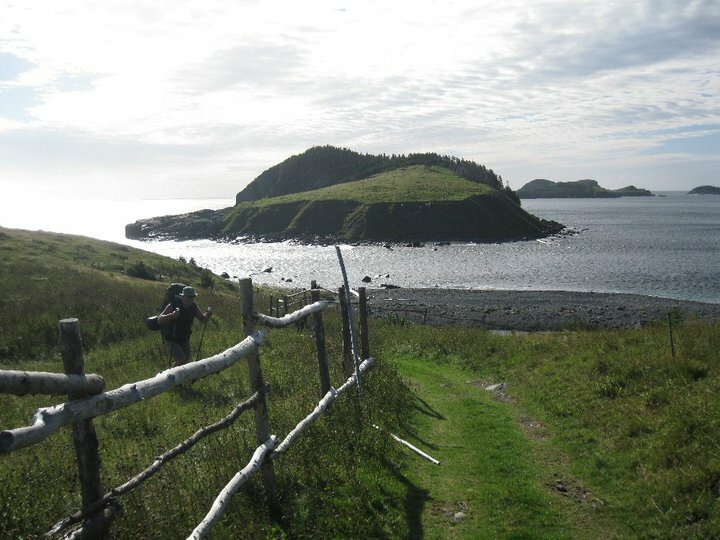 Our plan is to hike 150 kms continuously from Cappahayden to St. John’s. We expect to be camping most nights but to find restaurants and grocery stores in the communities we walk through to replenish our supplies regularly. We are also expecting a rather pleasant walk along the sea for most of the way, with none of the ladders, steep terrain or crazy cliff walks of the West Coast Trail on the far other side of the country. We are wrong on all accounts. For our first night of the trail we thought we’d just hike out a couple of kms and set up camp, but our driver “Dave” says he can’t think of anywhere that would be appropriate. Instead he insisted on taking us to a Bed and Breakfast. We spent the first evening in Ollie and Ken’s spare bedroom. They made us pizza and wings for dinner, and then sent us off with a fried bologna breakfast in the morning – health food. The next two weeks of our lives may go down as the most physically challenging trip we have ever been on. The map shows trails ranging in difficulty from moderate, difficult to very difficult, and it really is. This trail kicked our butts – every single day. Our first night spent out camping turned out to be quite miserable. Clearly camping is not intended for most of the trail, and that night we never found a suitable spot. We hiked through one town that may have had a B&B for us, but since we had not planned on that sort of accommodation we hiked through it. We ended up camping right on the trail, severely angled towards the ocean. It was pouring rain, way too wet to cook a meal, and we were too exhausted to try. We had some wine and cheese for dinner and slept fitfully all night, constantly feeling like we were about to roll over the cliff and into the Atlantic. Woke up to the sound of a sea-lion on a rock loudly wondering who we were. the long stretches of highway in between the trails are neither scenic nor pleasant. in 14 days of hiking we only ever meet one other person out on the trail. This fellow had hiked portions all summer. We met a couple in the grocery store that had given up trying to hike the trail end to end. The grocery stores and restaurants that we pictured in abundance never materialized. The tourist season is closed by September and so are many of the businesses that might have catered to us. 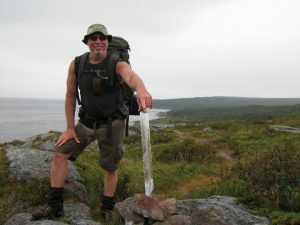 Walking anywhere that is not on a remote trail is difficult because of the Newfoundlanders themselves. We eventually stopped asking anyone for directions because anyone we asked would insist we accept a ride. Newfoundlanders are the friendliest, most helpful people I have ever met. 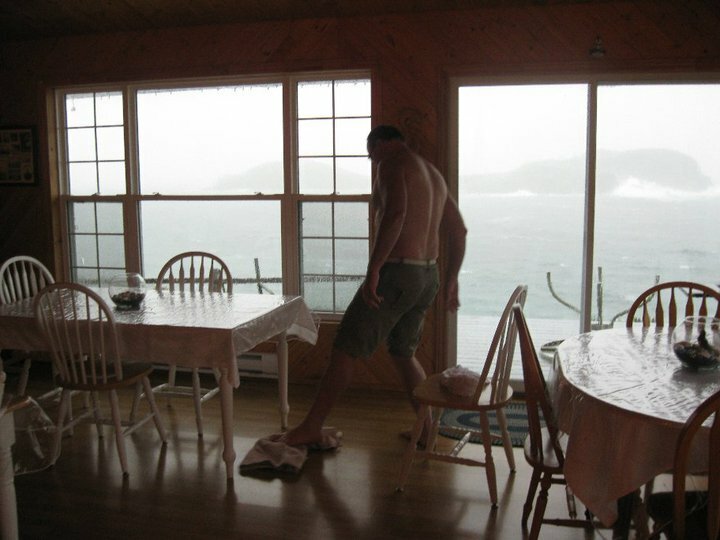 Newfoundland does, in fact, experience hurricanes. 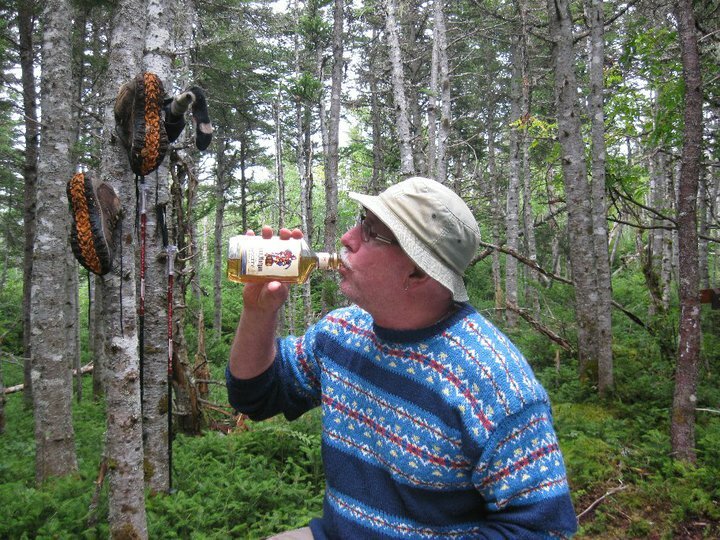 We were happily camped at a spot called La Manche one morning, when a man walked through our campsite. It was shocking to see a person, but La Manche is actually quite close to the highway. He stopped to ask us if we’d heard about the hurricane. Apparently Hurricane Igor was bearing down on us and was to be Newfoundlands first. Hurray for us. We packed up quickly and headed off to find shelter. 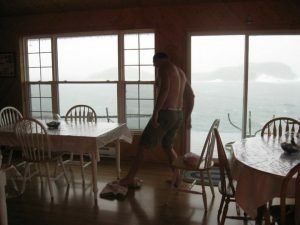 Just a couple of hours later we found an amazing place, the Whale Watcher B&B in the tiny community of Bauline. We were the only ones here in a place meant for at least a dozen people. We had an entire wall of windows facing the ocean. The owner, Gerry, loaned us his truck to drive up to Bay Bulls, a significant trip actually, to stock up on some hurricane supplies. From this dry, safe vantage point, we watched all of Hurricane Igor unfold. Until the power went out we kept the small TV tuned to the news. We mopped up water that seeped through the wall of windows all night long and stored their outdoor furniture that threatened to blow right through those windows. When the blowing finally stopped, a bright moon came out and we took the opportunity to BBQ a simple dinner. The power never did come back. This was not just Newfoundland’s first hurricane, but ours as well. Thanks to that guy who warned us at La Manche we enjoyed it – not sure we would have survived in a tent. We still had several days hiking left to St. Johns. The trail that we already found difficult became almost insanely so. There were so many trees across the trail that I began to wonder if we shouldn’t just stay on our knees to climb under them. On the day after the hurricane, we actually left the trail and just walked along the highway. We were hoping to find food, but the power was still out and nothing was open. We spent three more days on the trail, but the hurricane had turned it both too strenuous and at times dangerous. On the Spout Path we had to cross what should have been little streams flowing over the cliffs into the ocean, but now were rushing rivers from the hurricane. There was one where Ray went first and put his hand out nonchalantly to help me over. Once I was over he said “look down”, we were on the edge of a cliff that had washed away, and he didn’t want me to see the precariousness of our position until we were over. There were some cliff walks that had been washed dangerously thin. We both came off that trail with vertigo, a fear neither of us had before. Somewhere out on the Spout Trail we met a young man hired by the ECT Association to assess trail damage. He couldn’t believe it when he saw us. He told us the trail was closed and there were thousands of downed trees. He didn’t need to tell us about the trees. We decided we were done. 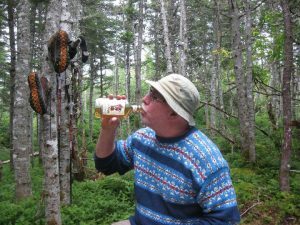 Instead of continuing the hike to St. John’s we were going to make it to Petty Harbour and call a taxi. The last day of the trail was actually one of the nicest. There was a long section with no trees where we just climbed gradually for hours. The scenery kept getting more and more dramatic. When we finally reached the top of this swell we could look back and see what seemed to be the whole of the trail behind us. We could look forward and see the incredibly picturesque town of Petty Harbour in front of us. On the top of that mountain my blackberry dinged – the first service of the entire hike. Turns out it was our kids, rather worried about their parents after hearing about the hurricane. 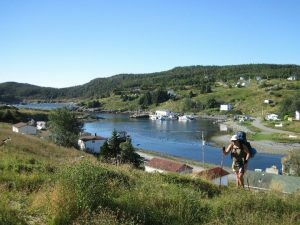 We hiked down into Petty Harbour and met a couple of fishermen just returning from work. They gave us directions to the hotel in town and told us that the only restaurant would be closing soon. We wasted no time. The next night was our anniversary, and we spent it in style at the Delta Hotel in St. John’s with a view of the harbour. Our bodies were broken like no other trail has ever broken us. We walked up to Signal Hill, limping all the way up and shaking in fear on the cliffs on the way down. The ECT has taken its toll. One should never underestimate Newfoundland, its trails or its people. My last observation? Way less has changed here in thirty years than I would have thought.